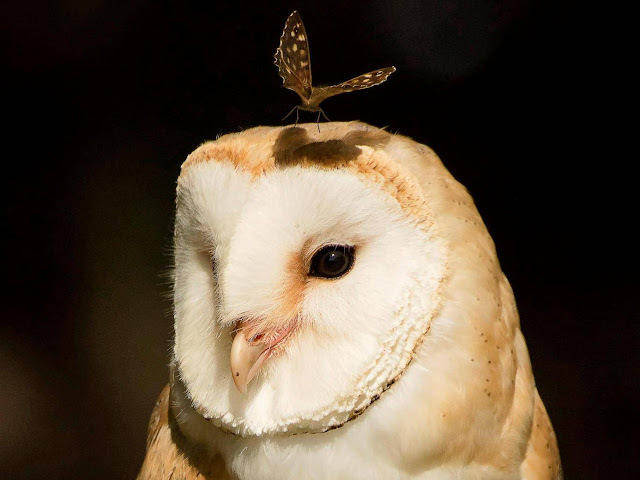 This perfectly-timed photo shows a stunning barn owl - with a butterfly on its head. Rob Bates, 34, took the photo of the bird of prey when it landed on a hay bail just 20 feet away. He noticed a butterfly flapping around the owl's head - and waited patiently for the perfect shot, in Bridlington, Yorkshire. Rob, a tattoo artist, from Aston, Sheffield, said: “I was on a bird of prey photography workshop. “Everyone took a few shots then moved onto the next bird, while the owl still stood there. “Then out of the corner of my eye I noticed something flying around it. “It was a beautiful butterfly so I re-positioned myself and waited for the perfect shot. “This butterfly looked as though it was almost attracted to the owl as it wouldn't leave it alone, flying around its head, while the owl wasn't bothered at all.